Northern Louisiana: Shreveport, Natchitoches, Alexandria, Monroe, and surrounding areas. Lake Charles Area: Sulphur, Lake Charles, Jennings, Crowley, and surrounding areas. Baton Rouge Area: Baton Rouge, Lafayette, New Roads, Zachary, and surrounding areas. New Orleans Area: New Orleans, Chalmette, Kenner, Mandeville, Bogalusa, and surrounding areas. Council Members serve many areas in Louisiana. Click on the area links to the above, the map to the left, or scroll down to find help in your area. Shreveport, Natchitoches, Alexandria, Monroe, and surrounding areas. 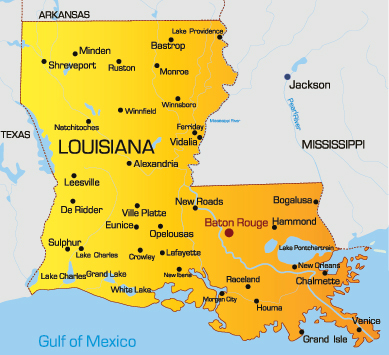 We can provide you contact with various elder care services in Northern Louisiana. Although this area is temporarily without a member to assist you we can still help you solve any concerns or problems you may have. Please contact the Louisiana Care Planning Council by clicking on the link below. Sulphur, Lake Charles, Jennings, Crowley, and surrounding areas. We can provide you contact with various elder care services in the Lake Charles Area. Although this area is temporarily without a member to assist you we can still help you solve any concerns or problems you may have. Please contact the Louisiana Care Planning Council by clicking on the link below. Baton Rouge, Lafayette, New Roads, Zachary, and surrounding areas. Alison Calamia is a Reverse Mortgage Specialist at America's Mortgage Resource, a well-known mortgage lender in New Orleans, Louisiana with offices in Baton Rouge and the Acadiana area. For 25 years Alison has been helping senior homeowners to understand and secure a Reverse Mortgage. Her personal face to face meetings enable seniors and their family's to make an informed decision when considering a Reverse Mortgage as a viable option to meet their financial needs. Alison specializes in the Federally insured Reverse Mortgage, also known as a Home Equity Conversion Mortgage (HECM). New Orleans, Chalmette, Kenner, Mandeville, Bogalusa, and surrounding areas.